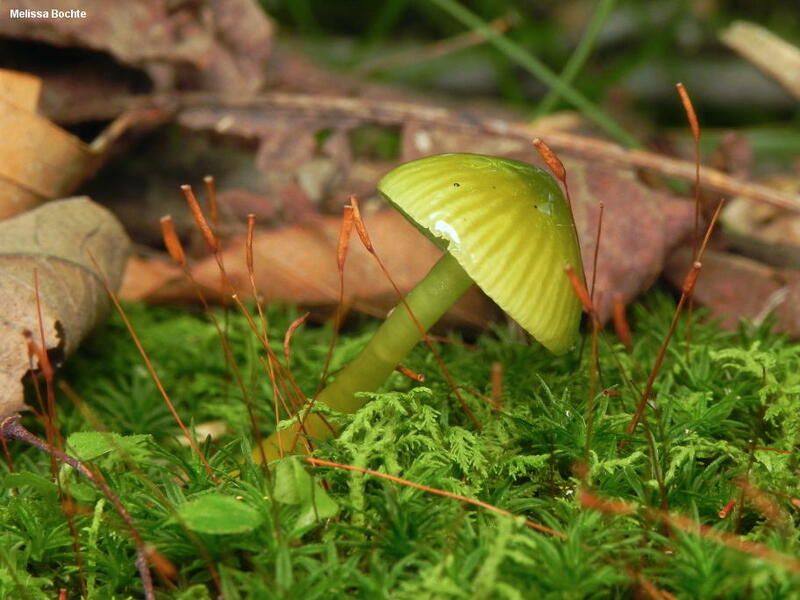 Sometimes called the "parrot mushroom," this little guy is unmistakable if you catch it in its early stages of development, when it is distinctively parrot-green (and decidedly slimy). But it quickly begins to change colors, turning yellow or orange, and then fading to a sort of dingy straw color. 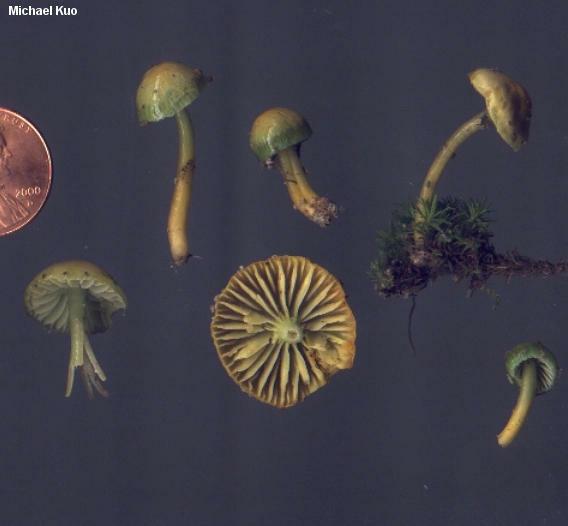 By the end of this transformation, the parrot mushroom has become a nondescript little thing, dirty yellowish and very difficult to identify. Ah, the splendors of youth! Gliophorus psittacinus was previously known as Hygrocybe psittacina and as Hygrophorus psittacinus, but a recent paper (Lodge and collaborators, 2013) has resurrected the genus Gliophorus for it, along with closely related species. 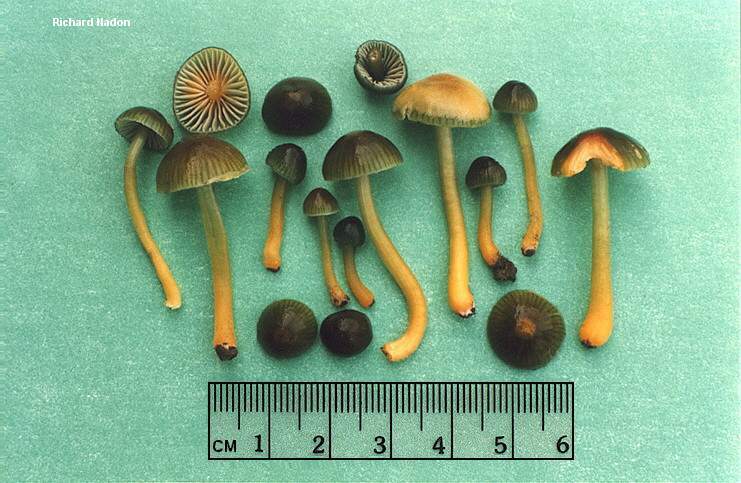 However, the researchers caution that Gliophorus psittacinus represents a species group: "[t]he extraordinarily high sequence divergence among collections identified as H. psittacinus indicates this is a species complex and is in need of further study." In coastal California a blue-then-red version of Gliophorus psittacinus appears under conifers over winter; see the page for Gliophorus species 01. In central Illinois I have collected a reddish version under eastern red cedar; its spores are somewhat more broadly ellipsoid than the typical version. 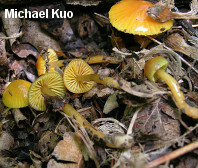 Hygrophorus psittacinus and Hygrocybe psittacina are synonyms. Ecology: Precise ecological role uncertain (see Lodge and collaborators, 2013); appearing in hardwood and conifer forests; growing scattered to gregariously; frequently found in moss, or on mossy embankments along wooded roadsides; spring through fall (or over winter in warmer climates); widely distributed in North America, at least as a species group. The illustrated and described collections are from Illinois, Michigan, and Québec. 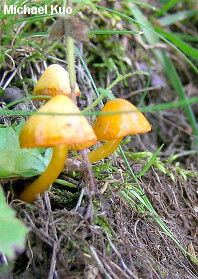 Cap: 5-25 mm across; hemispheric to suboval, expanding to broadly convex or nearly flat; bald; slimy; variable in colors but frequently dark green at first, quickly fading to orangish yellow from the center outward (sometimes sometimes orange with a greenish margin, fading to orange); finally dull orangish yellow; the margin often thinly lined. 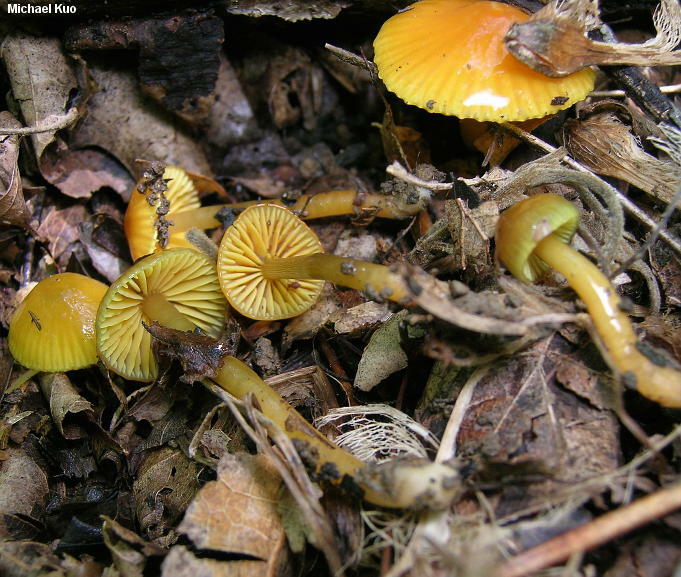 Gills: Narrowly attached to the stem; close or nearly distant; usually pale green at first, becoming yellowish--but sometimes orange-yellow throughout development; short-gills frequent. 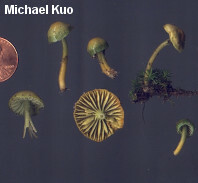 Stem: 10-40 mm long; 2-3 mm thick; equal; bald; slimy; pale green above and orangish yellow below when young, fading to pale yellowish overall. Odor and Taste: Odor not distinctive, or somewhat foul; taste of slime slightly acidic. 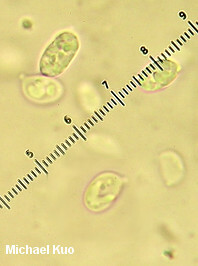 Microscopic Features: Spores 6-9 x 3.5-4.5 µ; smooth; ellipsoid; hyaline and multiguttulate in KOH; inamyloid. Basidia 35-45 µ long; 4-sterigmate or, occasionally, 2-sterigmate. Hymenial cystidia absent. Lamellar trama parallel. Pileipellis an ixocutis. REFERENCES: (Schaeffer, 1774) Herink, 1958. (Fries, 1821; Saccardo, 1887; Kauffman, 1918; Hesler and Smith, 1963; Bird & Grund, 1979; Smith, Smith & Weber, 1979; Largent, 1985; Arora, 1986; Lincoff, 1992; Barron, 1999; Boertmann, 2000; McNeil, 2006; Miller & Miller, 2006; Kuo & Methven, 2010; Lodge et al., 2013; Kuo & Methven, 2014.) Herb. Kuo 09039406, 06160208, 05120701, 05120702, 06080802.